The UK research team, led by Dr David Adlam (pictured above right), have been working as hard as ever and there are now more than 500 patients registered to take part in the research. Peripartum SCAD cases account for less than 10% of the patient population. A visible dissection flap can often not be seen during angiograms. A conservative approach to repeat angios is recommended where possible. Reported recurrence of SCAD is between 5 and 19%, although this may be over-estimated, as patients who have a recurrence are probably more likely to present to research programmes and to be diagnosed. Many patients experience recurrent chest pain after the SCAD has healed. This pain may be cyclical in pre-menopausal patients and may respond to treatment for coronary spasms. Cardiac rehab is recommended and safe for SCAD patients, although isometric or extreme exercise is not recommended. You can also listen to Dr Adlam talking about the paper in a podcast on the Heart Journal web page. 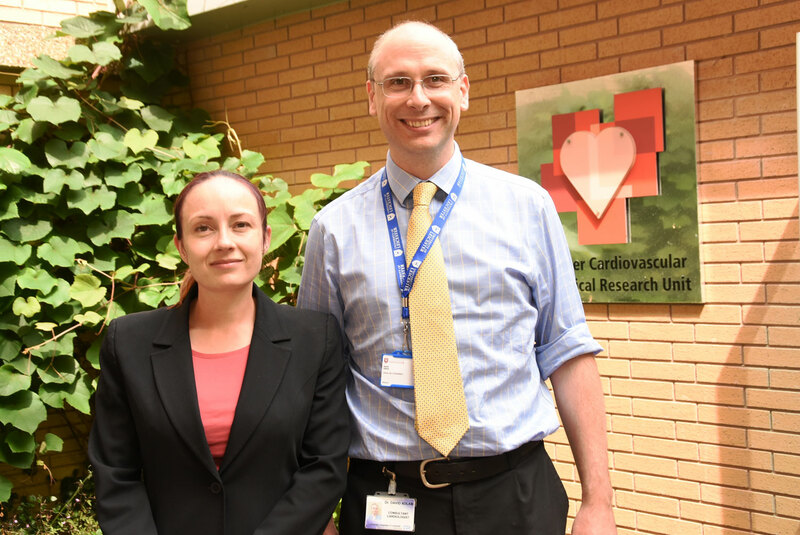 The research team, funded by the National Institute for Health Research (NIHR) and the British Heart Foundation (BHF), have seen and performed tests including MRI and ultrasounds on 197 patients and healthy volunteers. BHF funding came to an end during 2017 and Dr Al-Hussaini and the team are analysing the data collected. Dr Adlam said 2018 will be an exciting year as the findings are gradually unveiled in a series of publications. Depending on the results, the next phase of the research may focus on sub-groups of patients, for example men, women at different phases of the menstrual cycle, those who have had recurrent SCADs or SCAD around the time of pregnancy, rather than see everyone for research days. Targeting the research in this way is more likely to produce useful answers. They will also continue to see patients in the two NHS SCAD clinics at Glenfield Hospital, Leicester and Chelsea & Westminster Hospital, London. The team, including Dr Alice Wood (pictured above left), will also continue to collect epidemiological information via patient surveys, and genetic and biomarker data from blood tests from all new registrants. The research is now being funded by the NIHR and Beat SCAD.